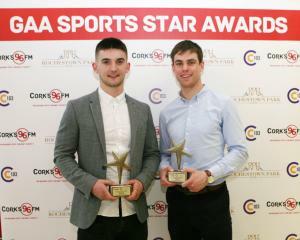 The 3rd level competitions are much sought after and it’s well known that UCC place huge emphasis on them both, so when the coveted double was achieved choosing the February sports star award was an easy choice. Joint winners are rare but fittingly Cian Kiely captain of the Sigerson Cup team and Shane Kingston of the Fitzgibbon Cup team were worthy recipients of the award presented in association with the Rochestown Park Hotel. In accepting the award Cian was delighted to be honoured and paid tribute to the players and backroom team for the hard work that brought them the ultimate accolade. Cian and Shane also expressed their thanks to the sponsors for the wonderful and both paid tribute to the work of UCC games officer John Grainger whose contribution to the College is unrivalled. Des also paid tribute to 96FM/C103 and Rochestown Park Hotel for their ongoing support of our games which is much appreciated. Tom Tobin Rochestown Park Hotel and Kieran Mc Geary 96FM also congratulated Cian and Shane and wished them continued success for the season ahead. Family, including Shane’s father former Cork senior hurling coach Kieran, and friends were in attendance while the UCC management teams were represented by Tom Kingston, Ger Cunningham, Mick Reynolds, Charlie Mc Loughlin, while the respective GAA Club Presidents Dr Con Murphy and Dr Paddy Crowley to acknowledge to key players in what was a historic month for the wearers of the famed ‘skull and crossbones’ jersey, also in attendance was Munster Council Treasurer Pearse Murphy. Cian and Shane now join January winner Charleville’s Daniel O’Flynn in the race for the overall award. The 2020 gala banquet will be held on the 31st January and we are delighted that the guest of honour on the night will be GAA President John Horan.